As you can see above, I wear two leg braces every day. Thanks to broken lower legs suffered in 2009 and 2013 I wear the braces for a couple of reasons. Their primary function is to act as a shin guard – no more pain when I walk into tables and doors – but they also help support my ankles and let me walk better than ever. Oddly enough, these injuries actually made my walking better. For the last two weeks or so I noticed that my left leg was a little sore. It wasn’t anything bad, nor was it cause for much concern, but it definitely wasn’t right. It felt like something wasn’t quite right when I was stepping down. However I ignored it because I had other things to worry about, like a research paper and Thanksgiving. Again, it wasn’t like I was in danger of serious injury, I just wasn’t terribly comfortable. 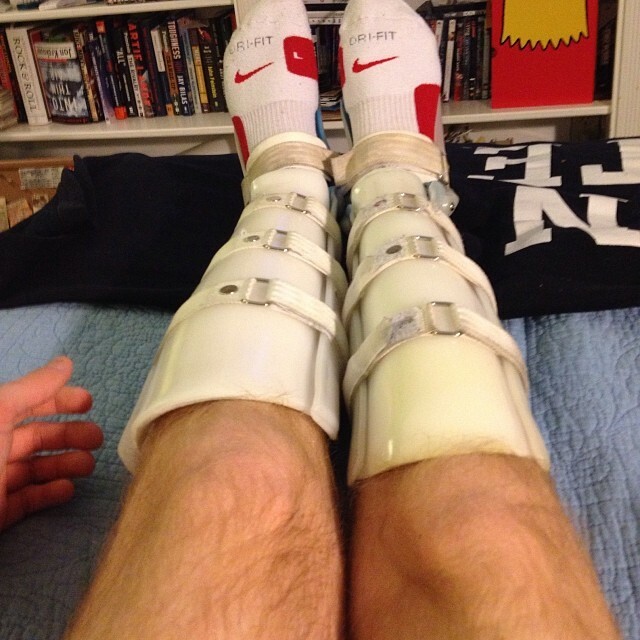 Just a day or two ago I adjusted my left brace with the velcro above. Turns out the top half of the plastic shell shifted and was now pulling on my shin in an awkward way. By moving it back I suddenly solved all of my nagging pain. Gone. It’s been terrific ever since. Why tell this story? Well, honestly I think it spoke to something larger that comes to a head this time of year. Finals period brings about the greatest amount of stress for students imaginable. These next two weeks are what the entire semester has been leading up to. Projects are due, tests are on the horizon, and coffee is being consumed at an all-time high rate. This little nagging injury was something I ignored because I had other things to take care of. Here’s the thing: The fix that I needed to make to my brace took maybe two minutes. It was entirely a little thing. It wasn’t important, but it was important. The big topics of our lives right now are those exams and projects. That’s what our focus is on. But it’s important to not ignore “little things.” What we perceive to be minor might end up becoming terrible in the face of extreme stress. Yes, this is another thing to throw on to people’s plates, but hopefully it won’t overload it. Again, these things could take a couple extra minutes of time to solve, and that time exists. People are going to be grinding out more than ever and studying a ton. But it shouldn’t be impossible to grab some food in there. Get some sleep, even for a few hours. If your foot hurts then just sit down for a little bit. We don’t like to admit it, but these tests are likely not the be all end all of your lives. My Death and Immortality final is important for my grade, but in ten years it’s not like the difference between an A- and B+ will preclude me from living a good life, all things else held constant. But I say this from the standpoint of someone that has suffered from ignoring “little things” before. In 2009 I thought I had a sprained ankle. I actually had a stress fracture in my right leg that was getting more severe with each step. Months of a cast and rehab later and I have learned to be more cautious in everything. But now especially I look out for problems that can be nipped in the bud. Just take a second, take a deep breath, and think if there’s anything small you can just get set now. You’ll thank yourself when finals are over and you don’t have to run to set out 10 more fires. This time of year isn’t easy, but it can be survived. Taking care of yourself is the best step to making that happen.